Before we get into this post, read the one about the lobster. No particular questions from the 8/6 post, so here we go. Are you superstitious? Some people will not even get out of bed on Friday the 13th. Not Shoreman, I go fishing. Picked up Bob (unofficial blog photographer, Bob. Also I plow for fish, Bob) at 0700 and headed for Red Lake. Stopped at Cooks Station for coffee and off we went. 1 1/2 hours of fishing and all I had to show for it was one little 9" Brookie I caught on a gold Kastmaster. Wasn't worth keeping, so he went back for another day. 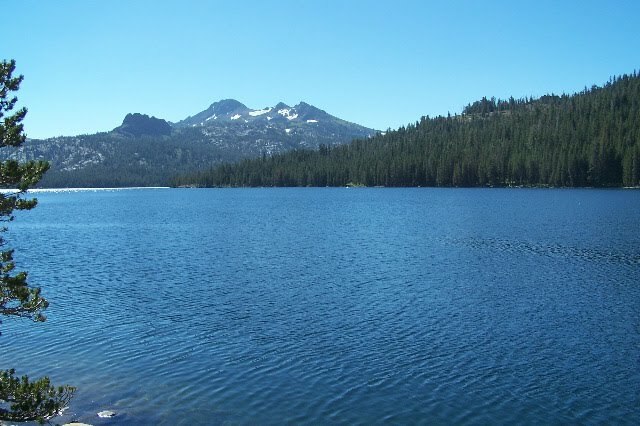 Packed up and headed back to Caples Lake. Found a spot to park at the dead tree and wandered down to the lake. Wanted to bring to your attention the snow on the far mountain. August 13th and still snow on the hill. Next to us was a gentleman fishing and as normally happens, we start yaking. Turns out this guy is Jerry Brown. You know the guy running for Governor in California. Nope, not that Jerry Brown. Seems Jerry stopped at Cooks Station for coffee this morning and was told about some guy that caught 22 trout at Red Lake last week. Hmmm, wonder who that could be? Well, Jerry needed some assistance because it was his first trip to Caples. 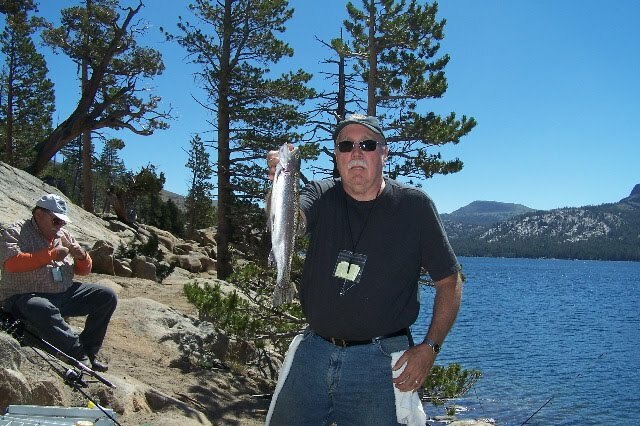 He lives over in Tuolumne County (South of here) and usually fishes Alpine Lake and a couple of other lakes over there. Being the good guy I am (pat on the back, pat on the back. OK, I'm a Leo. ), I set Jerry up with the same slip sinker rig I use. It was one of those, I've got fluorocarbon for leader, but don't have small treble hooks. So we dug around in his box and my box and got his two rods rigged. We also used the little dollop of Anise, just in case. Here is how it went. I caught one on one rod, then another on my other rod, then Jerry caught one on his rod, then one on his other rod, and so forth and so on. Then I caught this one. That's Jerry sitting in the background. He has a lot more hair than that guy running for Governor. On the handy dandy Berkley Digital Scale, 1.11 lbs. Didn't get a length measurement, but I'd estimate 20 or 21 inches. I caught one more (4 on the stringer) then Bob and I called it a day. At that time, Jerry had 4 on his stringer also. We packed up and as we topped the hill, Jerry yelled that he just hooked his 5th. Not a bad day for Friday the 13th, even for the new guy. This picture was of the big one coming to shore, but what I really wanted you to see was the clarity of the water at Caples. OK, the fish too. Crystal clear water compared to the green (and now almost a teal color) at Red Lake. After 4 days of loading, hauling, and unloading 3 cord of firewood (6 trips in my pickup), it was nice to have a day of rest, just hanging out at the lake. Nice having Bob for company and nice meeting Jerry (even though he's not the guy running for Governor or may we're better for it). That's it for this adventure. Till next time. Thanks alot for making since of all the weird stuff that happend. like the damn hook not staying in!!! Good Day - nothing scary about that! What a gorgeous lake with fantastically clear water. The fish have more brilliant colors in these conditions and amazing to look at. The remaining Knights of Templar would be proud. This group was virtually wiped out on Friday the 13th by order of the pope Oct 13, 1307. Hence the superstition. I love Friday the 13th. Well done on the fishing. Both Red and Caples look fantastic. I'd be happy to fish either any day of the week. What makes one bite so well and the other no bites, same day? I must say I have never met an unfriendly person while fishing--sounds like you haven't either. Enjoyed the Post. You know Mark, the only thing I can think of at Red Lake is that the Brookies we caught so many of, were probably planters. Once most of them were caught, that was it. Come Fall when they get ready to spawn, the action will get hotter. 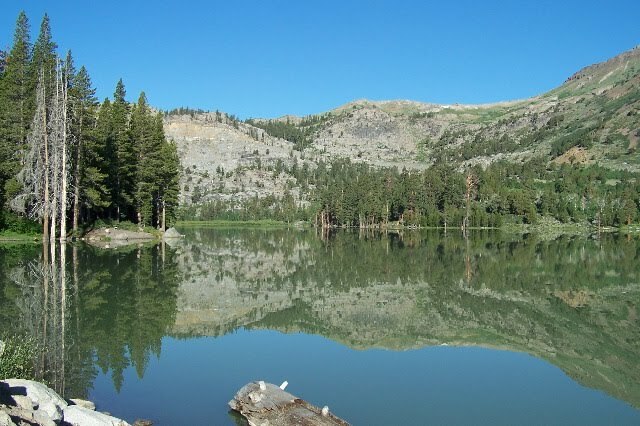 Caples, I think it's the place we fished. there seems to be a "seam" where the fish cruise by. 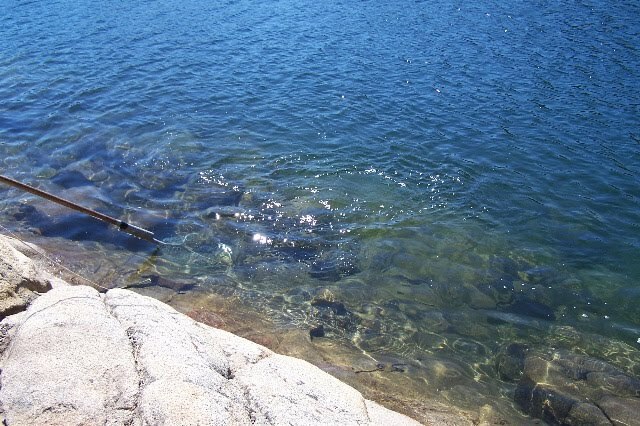 Once the water in Caples lowers, the fishing gets better.